Success for most people doesn’t just happen, it is planned, pursued and realized many times, over many years. Success with your money is no different. 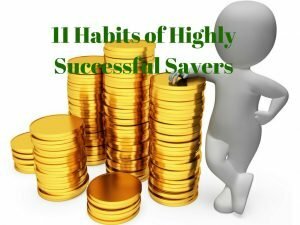 If you want to be a rockstar when it comes to saving money, here are 10 habits of highly successful savers. Most people live well beyond their means, live paycheck to paycheck and sign up for debt obligations that may leave them cash strapped and financially inflexible. When someone eats healthy foods and works out regularly, it doesn’t take long to notice the results of their effort. They have more energy and usually look and feel much better for making these choices. Financial fitness however, is not as obvious. Most people can go years if not decades without addressing their debt or other financial problems. As an outsider looking in, it is important not to compare your lifestyle choices with others. Your peers may be wealthy and able to afford their lifestyle, or they may be picked in debt to maintain their lifestyle choices. In most instances, it would be difficult or nearly impossible to know the difference unless a major financial hardship arises. A better approach is to focus on you and your family building wealth. Whether you want to retire at 45, 55, or 65 years old, successful savers know that saving for retirement and planning for their financial future is important. Because of this, they strive to max out their retirement contributions like their 401k (Registered Retirement Savings Program in Canada) or Roth IRA (Tax Free Saving Account in Canada). They use a combination of regular contributions and effective tax planning to build their wealth over time. Rome wasn’t built in a day, and for most people, neither is their wealth. To get to the millionaire club or anywhere close to it, starting early and saving often is key. Successful savers employ this savings philosophy on all sources of income including a tax refund, bonus, monetary gift and of course regular income. Before they spend any of the money coming into their household, they allocate a portion to savings/investing. Compound interest over many years, steady returns and an automatic savings plan are the building blocks of successful savers. This is usually a tricky topic to navigate in the personal finance world because almost half of Americans have a car payment with the average car payment of $493/month over 7 years. With these numbers, you have a 50% chance of offending someone who does have a car payment, but that still doesn’t mean they are a good ‘investment’. Yes, you may need a vehicle to get to and from work and earn an income, but you don’t necessarily need a car payment to do so. A vehicle is a depreciating asset that also requires maintenance and additional expenses to own. Once you factor in maintenance fees, insurance, registration and gas, the expenses can add up. Successful savers know that freeing up their income and spending it on things that build wealth (e.g. financial and real property) may take time, but is an effective way to financial freedom. They save up cash and buy a reliable used vehicle (or buy a new vehicle outright if they can afford it) that will still allow them to go to work and take care of their family. If the average car payment is $493/month over 7 years, someone that opted to save and pay cash for a less expensive used vehicle and invested this money instead would grow their wealth over time. Let’s say this person took the $493/month and invested it in a balance aggressive portfolio with an average rate of return of 6%. This person is 30 years old and plans to retire when they are 65. From age 30 to 37, the 7 years needed to pay off the car in full, this money would have grown to $51,308.45. Let’s say they decided to stop investing after age 37 and left the money invested from age 37 to 65 (28 more years), their nest egg at retirement from this 7-year contribution would be $274,148.36. Successful savers know that looking at their money this way may change their perspective on how they spend. Car payments present a huge opportunity cost from building wealth and most Americans spend a disproportionately large amount per month on this expense. Whether they rent or own, successful savers understand the importance of diversifying their investments. This includes not tying up all their income on real estate or financial investments, but finding a balance from both. Successful savers strive to keep their housing costs below 35% of their take home pay (to a maximum of 40%), giving them flexibility to save and spend as they wish without incurring more debt. When choosing to own, they complete a family budget and determine realistically how much in housing costs they are willing to carry on a monthly basis. They factor in future life choices like what would happen if one partner lost their job, if staying home with the children during their younger years is a priority for them and if so, how will they bridge the loss of income and how much would this affect their ability to carry a mortgage and other housing expenses. Lastly, successful savers do not just accept the highest mortgage loan they qualify for. They understand that most financial institutions do not have their best interest at heart and are in business to make exceptional profits. They also understand that no one knows their financial situation and day to day expenses better than they do and they take responsibility for the financial decision they make. Successful savers understand their biggest wealth building tool is their income and the ability to have their spending (and saving) be dictated on their terms and not on the lenders terms. To weather unexpected expenses which can arise through no fault of their own, they have a fully funded emergency fund and don’t rely on debt. Having at least 3 months of basic living expenses set aside for unexpected expenses, they have peace of mind knowing that when (and not if) an emergency arises, they are ready to deal with the expenses. They don’t lose sleep thinking about how this money could be invested in some other way to get higher returns and are comfortable keeping this money in a savings account or certificate of deposit (guaranteed investment certificate). They use other monies earmarked for retirement or long-term savings to take on the risk needed to get higher returns. Successful savers understand that wealth does not happen by accident. They are intentional about how they spend and save/invest their money and use a written budget each month to tell their money where to go. They don’t think budgets are restrictive, but rather, use them along with other tools to build their wealth. Successful savers also have their monthly savings contribution at the top of their budget, not the bottom. They make sure they get paid before everybody else does so that in the future, they will have the money they want to live the way they want (or close to it). With the rising cost of living and stagnant income experienced over the last decade or so, successful savers know that a savings rate of 10% is great, but may not be enough to meet their long term financial needs if incomes remain the way they are. To ensure a comfortable retirement, successful savers strive to save 15% of their take home pay. If they can save more, they will, but they use this savings rate as their minimum. A 15% savings rate is not unrealistic for them because they live on a written budget, have no car payments and keep their housing costs manageable. These lifestyle choices allow the saver to balance both real property and financial assets in their overall portfolio. A balance between cash and non-cash investments puts them in the best financial position during good and bad economic times. Successful savers also know that their income is only one way to build wealth. They also employ effective tax planning throughout the year to ensure they keep more of the money they make. They use deductions, credits, income splitting and plan their investments to maximize growth and minimize tax as much as possible. They invest in assets that will favor capital gains, dividend income and even no taxation over interest income or other investments that are fully taxable and at their marginal tax rate. They are not hesitant to pay a tax professional if needed to ensure they are building their wealthy effectively. They feel the benefit for this expense far out ways the cost and are willing to spend this money, especially when dealing with complex investments and business structures. Successful savers know they can’t save for every expense and invest for their future. They are willing to get the right amount and type of insurance to cover them for expenses that they would otherwise be unable to realistically cover without enduring major financial hardship. They shop around for the best coverage at a reasonable premium and look at other factors like the insurance company’s pay-out success rate. They also don’t over insure themselves and pay high premiums month after month. Because they save regularly, they can rely on other sources of income to meet these unexpected expenses if need be. Consumer debt is debt that funds consumption and not investments. The source of the consumer debt is irrelevant. Whether you use credit cards, a line of credit or pay day loans to fund consumption, using debt to fund something that will be consumed robs your future income from maximizing its full potential when you must pay back this debt with interest. Of course, not all debt is created equal. Credit card and payday loans are probably the worst ways to fuel consumer debt as the interest rates of these credit products will eat up more of your future income. Unless you pay the balance off each month, or before any interest expenses are incurred, successful savers try and minimize their consumer debt as much as possible and use cash instead for these consumer goods and services. These habits briefly outline just some of the many things we can all implement to maximize our savings potential. Even if we don’t make use of all the habits listed above, even implementing some of them will make us financial better off.